We are proud to present a new joint publication by the Oil Companies International Marine Forum (OCIMF) and the Chemical Distribution Institute (CDI). 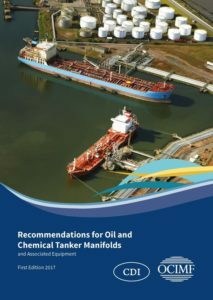 Recommendations for Oil and Chemical Tanker Manifolds and Associated Equipment provides clear recommendations and guidance for oil tankers, chemical tankers and dual classed oil/chemical tankers with the aim of achieving improved safety, standardisation and compatibility with terminal facilities. It supersedes the fourth edition of OCIMF’s Recommendations for Oil Tanker Manifolds and Associated Equipment (1991). This new book contains a significant amount of new tanker industry accepted recommendations on safety and equipment, including additional tonnage categories and recommendations for ship owners. The Oil Companies International Marine Forum (OCIMF) is a voluntary association of oil companies with an interest in the shipment and terminalling of crude oil, oil products, petrochemicals and gas. Our mission is to be the foremost authority on the safe and environmentally responsible operation of oil tankers, terminals and offshore support vessels, promoting continuous improvement in standards of design and operation. The Chemical Distribution Institute (CDI) is a non-profit and non-commercial organisation funded by the chemical industry to continuously improve the safety and quality performance of marine transportation and storage of bulk liquid chemicals. CDI manage global inspection schemes, providing consistent inspection data for the international chemical industry to use in their risk assessment processes. CDI is incorporated under the law of the Netherlands as the Stichting Chemical Distribution Institute and operates from a registered office in the United Kingdom.